In today’s world of e-commerce, many businesses never close. Stores open their doors 24 hours a day, global enterprises that operate across time zones and support customers and suppliers non-stop. Today being “on the payroll” day-in and day-out is the goal and the avoidance of downtime is a critical concern. To answer the challenge of downtime, Noble has implemented an effective and efficient inventory system throughout its global fleet, with the goal of improving the efficiency of operations and reducing the risk of downtime. Prior to 2009, Noble, and most offshore drillers for that matter, had the luxury of maintaining inventories of a few key components at each rig. Decisions on what parts to keep on hand were largely based on personal experience and historic experience. As rigs grew in complexity and the fleet grew more globally dispersed a more systematic approach was needed. Owners of a Rolex watch may believe them to be among the most complex and demandingly made products in the world – but in reality they contain fewer than 120 moving parts. By comparison, many of the systems aboard a modern drilling rig have thousands of individual parts – all made to exacting tolerances. Failure of any of these parts can bring drilling to a halt. “For example, the engines that power our HHI drillships are made up of over 1,500 distinct and unique parts,” says Rod DeVersa, Director of Procurement. “When you consider that each of the four ships has six engines – that represents tens of thousands of individual parts. “It’s not necessary that we have all of those individual parts on hand at any one time, but clearly we have to understand how likely they are to fail and how best to get replacements if they are needed. In the case of the main engines installed on the HHI ships, we inventory over 350 of those unique parts for routine and preventative maintenance requirements. On Noble’s drilling rigs today, heightened attention to preventive maintenance, regimented order points and mandated minimum stock levels are the norm. When the reorder points are reached, a requisition is automatically proposed, reviewed, approved and sent to a buyer in Supply Chain who sources and manages the purchase order. This helps ensure that in as much as possible, parts are on hand at the rig level for many of the most often replaced parts. Efficiency of the procurement process is strengthened with fixed price and delivery contracts that account for fifty percent of all materials supplied to the rigs. Having the right part on hand or available at a vendor can sometimes be just half the battle. Getting the part to a rig on the other side of the world often falls to Kevin Smith, Noble’s Senior Logistics Manager. “By working closely with our suppliers and our forwarders – a missed shipment rarely happens – even to remote locations. We all understand clearly that the ramifications of not having a smooth-running logistics operation can have a profound impact on our bottom line. We never want a rig to go offline because we are waiting for materials,” he adds. Materials and supplies are sent via air, ocean, or ground shipments to regional hubs, then into the country nearest to the offshore rig being supplied. Logistics providers in each country handle customs and last-mile shipping, then make deliveries to shore bases operated by Noble. One such shore base is located at Bayou Black, Louisiana, which handles freight shipments bound for the Company’s fleet in the Gulf of Mexico. In 2014, the Bayou Black facility coordinated the shipment of more than 3,200 “packages” bound for Noble rigs. This volume is all the more impressive when you consider that they represented a combined weight of more than 5 million kilograms (11 million pounds) and a value of more than $100 million. Most important was how the timely movement of those materials supported Noble’s performance. 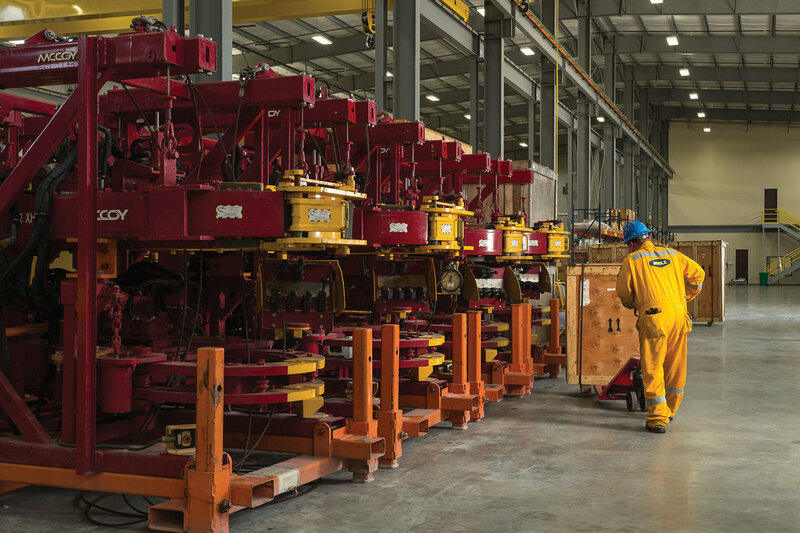 Noble’s global supply chain encompasses large, highly technical equipment as well as standard supplies used by rig crews such as switches, electric motors and valves. The Company purchases materials and supplies throughout the regions it operates in and employs buyers who are responsible for those specific areas. Approved purchase orders are sent via electronic information interchange to freight forwarders, each of whom has a two-way EDI link to Noble’s SAP system. “We get items into our supply chain system as soon as possible, so we work with contracted logistics providers that have a link to us,” Smith says. Solid relationships with suppliers also help Noble overcome the logistical challenges that are inherent in operating a global, high-spec fleet. Direct spend with our suppliers is in excess of $700M annually. Of that, the top 10 make up more than 50 percent of the total, making Noble a significant customer to parts and components suppliers.